Blakes 7 was a science fiction series by the BBC which ran from 1978 to 1981. It was one I loved when it was first broadcast, even though I was just a small child at the time and too young to really understand it; however the entire series is available on DVD and I’ve watched it again as an adult. It’s been called “Britain’s Star Trek”, but this is a bad description. It is very different to Star Trek. Both series are set in space in the future, but Star Trek paints a very optimistic view of the future. Earth is a political paradise and the only violence and war comes from hostile aliens like the Klingons. 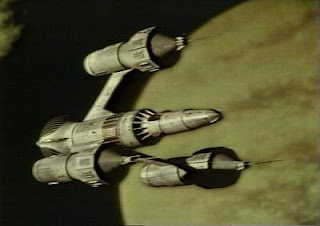 Blakes 7 is deeply distopian, where the Universe is ruled by the Federation, an Orwellian superstate, like the NWO, but far worse because it’s spread to other planets! The crew of the Enterprise are very cosmopolitan; they feature men and women in almost equal numbers, and of many races: not only an alien from the planet Vulcan, but a Russian, a Japanese, a Scotsman and a Swahili-speaking woman. The Enterprise compliment wear egalitarian uniforms, all the same with very small badges of rank. They enjoy an easy-going, even loving camaraderie, whereas the Liberator crew are somewhat dysfunctional (which makes them far more interesting!) and Avon is a cad worthy of the Federation itself! Blakes 7 was very low budget and became famous for its homespun production design and special effects. The bulkheads of the spacecraft wobbled when touched because they were obviously made of cardboard! But Blakes 7 had an important message for science fiction: If you have a good storyline, with good characters and a good script then you don’t need fancy special effects. Conversely if you have a crap storyline with shallow characters and a lame script then big-budget SFX won’t save it; Independence Day comes to mind! Episode 1 "The way back": Public surveillance cameras (very first shot! ), mind-control drugs administered to drinking water, manipulation of the media and justice system. Episode 2 "Space Fall": torture and abuse of detainees, alien civilizations. Episode 4 "Time Squad": Chemtrails, ESP, cryogenic technology, electronic mind-control implants (verichip etc). Episode 5 "The Web": Genetic engineering, extreme general and social hyperDarwinism, external control of the human body, thought projection. Episode 6 "Seek-Locate and Destroy": Methods of military mind-control. Episode 7 "Mission to Destiny" (This one is like an Agatha Christie detective story.) Free Energy. Episode 10 "Breakdown": Corruption in the medical profession (see books by Ghislaine Lanctot). Episode 11 "Bounty": (This is one of the best episodes, and the most relevant to today) Political manipulation strategies, problem-reaction-solution, the use of native puppet leaders. Episode 12 "Deliverance": Origins of the human race, lost civilizations. Episode 13 "Orac": Artificial intelligence, artificial body parts, secret science. Episode 14 "Redemption": Chaos Theory vs prediction. Episode 15 "Shadow": (This is one of the most significant!) Illegal drugs being used to enslave the populus, the Illuminati operating through organized crime as well as the police; both sides of the law being run by the same people. Extradimensional entities and energy. Episode 16 "Weapon": Secret military technology, Artificial life, armed forces used as "cannon fodder". Episode 17 "Horizon": Indigenous people being used as slaves as in "Project Avalon", the Illuminati using puppet leaders who are native to their charges and unaware of the higher powers they are serving. Episode 18 "Pressure Point": Diversionary tactics and drawing fire away from the true source of power, as in the NWO making it look like America is the centre of global control when it's not. Episode 19 "Trial": An entire world as a single ecosystem, the Gaia Principle. Rigged official trials and hearings. Episode 20 "Killer": Biological warfare. Episode 22 "Countdown": Mutually assured destructive Doomsday weapons used to quell rebellion. Episode 23 "Voice From The Past": Mind control long range transmission, the govt infiltration of supposedly impartial institutions that are supposed to make the govt accountable to the people like the legal and political system. Episode 26 "Star One": The destruction of knowledge leading to Illuminati secrets. Episode 27 "Aftermath": The question of whether peace can, or should, be maintained by the deterrence of ultra-destructive weapons. Episode 28 "Powerplay": The right to live as you choose versus the idea that what the elite consider best for you should be enforced. Human slaughterhouses where organs are harvested for donor surgery (see "Coma" by Robin Cook). Episode 29 "Volcano": Does passivism work? Episode 30 "Dawn of the Gods": Mythology and even children's stories contain hidden meaning. Episode 32 "City at The edge of The World": Ideas about the suppression of goddess figures and femininity in favour of a totally male pantheon. Episode 33 "Children of Auron": Biological warfare, test-tube birth, telepathy. Episode 34 "Rumours of Death": Double agents and infiltration by the Illuminati. Episode 37 "Moloch": The name speaks for itself! A parasitic creature ruling in secret and demanding sacrifice. Episode 38 "Death Watch": virtual reality, political manipulation, problem-reaction-solution etc. Episode 39 "Terminal": Artificial life. Episode 40 "Rescue": Psychic vampires and hyperD energy shortcuts. Episode 41 "Power": Sexual discrimination and segregation used as a method of genocide and population control. Episode 44 "Animals": Genetic engineering, secret science, suggestive hypnotism, MKUltra etc. Episode 45 "Headhunter": Secret development of cyborgs. Episode 47 "Games": See "Horizon" and "Project Avalon". Episode 48 "Sand": HyperDarwinism and sexual conformism. Episode 51 "Warlord": Biological warfare + mind control drugs in drinking water and air. Episode 52 "Blake": Illuminati infiltration of outwardly innocent organization. Very useful material, much thanks for the article. Hi love Blake seven too. I agree with your illuminati interpretation. The funny thing is I am currently watching "sarcophagus" and there is illuminati symbolism all through it. The all seeing eye and triangle. Interesting.